Thank you so much for taking care of the pedigrees. Now I can register them in Holland without problems. Ginger and Hutchie are doing fine. I gave them a bath yesterday, Ginger was sweet but Hutchie like the man he is, he did not like it at all. I have told him that he is living with a professional groomer now and that he will be groomed and bathed very often (hihi). They are both so easy to handle; language no problem, things in the house no problem, walking no problem, other dogs no problem. I make pictures tomorrow; it is so busy over here. I made some pictures today from Ginger in the garden. She was a little bit shaky because it is cold here in Holland. 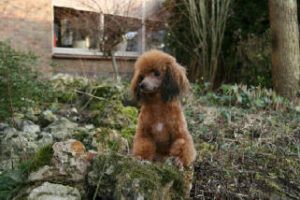 I will bath Hutchie tomorrow and make pictures of him than. They both doing great. Ginger is a very happy dog, always playing. 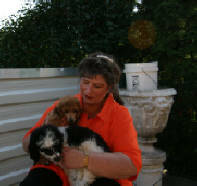 Nicole, with Hutchie and Ginger soon after they were sent to her in the Netherlands.